Last week, Oklahoma City Thunder superstar guard Russell Westbrook was honored at UCLA’s Pauley Pavilion, in recognition of the Bruin alum’s large contribution (terms undisclosed) to the school’s soon-to-be constructed Mo Ostin Basketball Center. The center will serve as a fully equipped practice facility for both the school’s men’s and women’s programs, with the men’s practice court named directly for Westbrook. Coverage of the ceremony, which was attended by most of his OKC teammates, is available via this link. 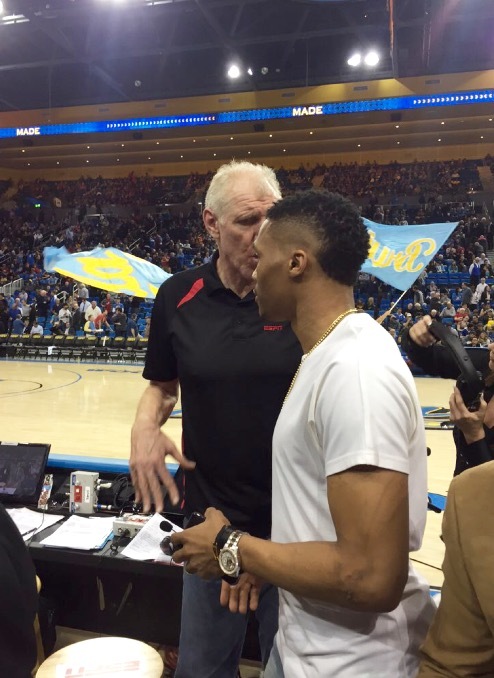 During the course of the evening, Westbrook engaged in conversation with the great Bill Walton, who of course is one of the best players in the history of both UCLA and college basketball. Here is an up close photo, provided by an iFolloSports.com reader, of the men mixing it up. Westbrook fans can also check out iFolloSports.com’s behind the scenes coverage of OKC’s multiple recent visits to Los Angeles.